As part of our roofing service in Huddersfield, we specialise in cleaning, repairing, and replacing fascia and guttering in Huddersfield. One area of a roof that requires frequent maintenance is the area where the roof meets the outside wall and the guttering. Historically, this area was made of wood. However, if these boards are not maintained and painted, they often suffer severe rotting and require replacing. Although wooden replacements are possible, there are many uPVC solutions that are maintenance free. They look clean and often have much longer lives that the wooden alternatives. 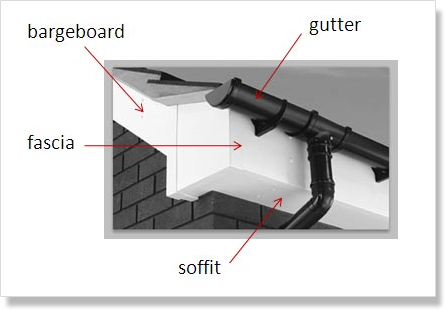 If you would like advice on replacing or maintenance of any part of your home's fascia and guttering we will be pleased to describe the different alternatives and their costs. Moss and tree debris can seriously impede the performance of your roof and clog your gutters. This can cause unsightly overspills during rain showers, and lead to more serious problems with your gutter and fascias. A l Farrar offer a roof and gutter cleaning service that is fast and efficient. It will leave your roof and gutters in great condition. We will also give your roof a thorough inspection and let you know of any likely work that might be needed in the future.